Canadians want electric vehicles (EVs) to become the majority of consumer vehicles sold, and they see that happening soon, according to a poll conducted by Abacus Data and Clean Energy Canada. 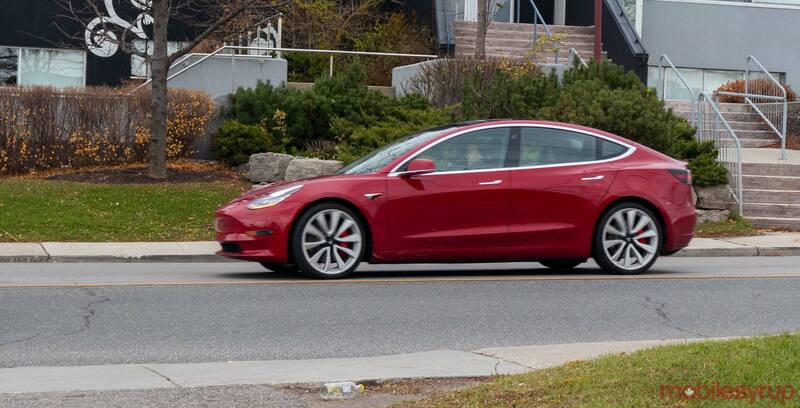 According to the study, 64 percent of respondents would prefer EVs to become the majority sold in Canada. Further, the desire to see electric vehicles become the norm is stronger with young Canadians, left-leaning Canadians and Canadians who don’t live in Alberta. 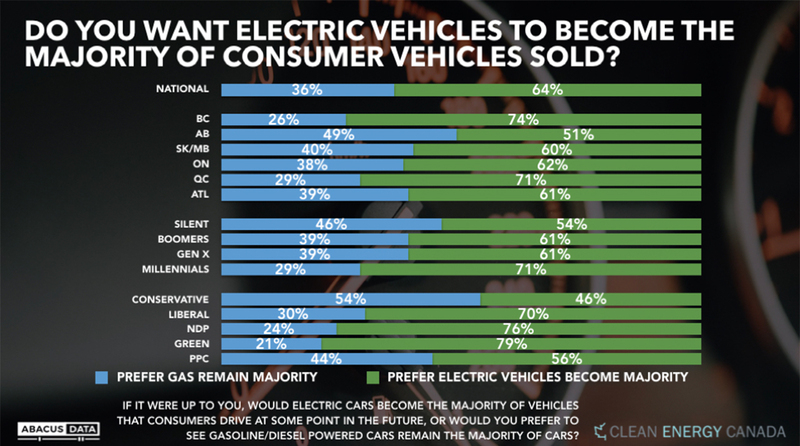 Still, about half of Albertans and Conservatives would prefer EVs to become the majority. The poll results also show that when it comes to buying a car today, more Canadian consumers will consider an electric vehicle than gas. However, only 10 percent of respondents said they were certain they’d purchase a gas vehicle. Clean Energy Canada attributes this shift in interest to how people perceive electric vehicles. 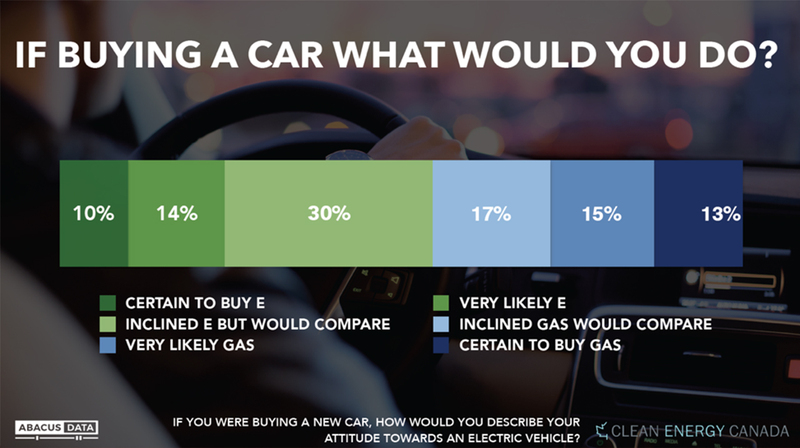 Poll respondents saw climate and air quality upsides to owning an EV. Additionally, two in three respondents also see advantages in fuel cost savings with an electric vehicle. When it comes to factors that influence people’s considerations in buying an EV, poll results suggested that knowing there were enough charging stations was most important. Knowing that you could recharge quickly and that battery improvements increased the range of electric vehicles were also important, influential factors. 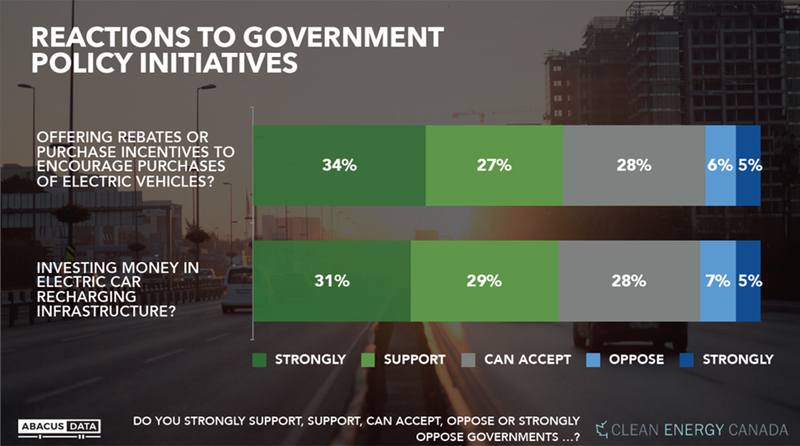 As for government policy, the majority of respondents supported initiatives like rebates or purchase incentives to encourage EV purchases or government investments in recharging infrastructure. Less than 15 percent of respondents would oppose either of those policies. 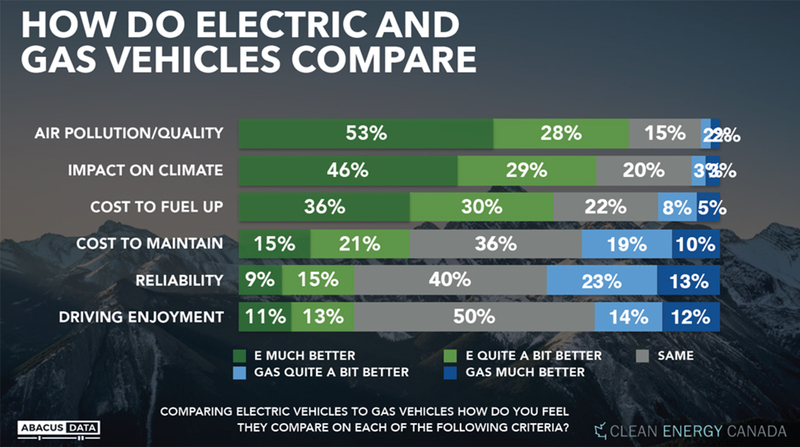 Ultimately, the survey suggests Canadians are in favour of electric vehicles and want to see them become the norm soon. Abacus and Clean Energy Canada conducted the poll online with 1,495 Canadian residents aged 18 and over between March 11th and 13th, 2019.